Canadian Patrick Piuze has a compelling story, from running a wine bar in Montreal to making AOC Chablis wines with Chardonnay grapes that have gained admiration from respected wine authorities such as Jancis Robinson MW and Robert Parker's Wine Advocate. Attracted both to the wines and the beauty of Burgundy he spent some time working for Olivier Leflaive, the renowned négociant based in Puligny-Montrachet, before studying at the CFPPA in Beaune to get a formal education in his new career before going on to make Chablis for Leflaive. Determined to broaden his experience and knowledge Patrick then spent a period working for Jean-Marie Guffens' negociant firm Verget, based in the Macon region in the south of Burgundy, learning about the importance of terroir in the making of great Chablis. He did such a good job there that his next position was as head wine-maker and cellar-master for one of the top Chablis producers Jean-Marc Brocard. Incredibly after only one year he decided that he possessed both the experience and the confidence to strike out on his own for the 2008 vintage as a "vinificateur & éleveur", one who vinifies and develops wine himself. Not owning any of his own vineyards he had nonetheless identified some terroirs that produced the quality of grapes that he sought and which were available to rent due to them being too steep or difficult to harvest by machine. In order to fulfil his exacting requirements he actually manages these vineyards from Petit-Chablis, village, premier cru as well as grand cru sites on long contracts. His success has been meteoric and he has quickly developed a demand for his pure Chablis wines as far afield as the United States, Japan and Hong Kong as well as in France and other Northern European countries. 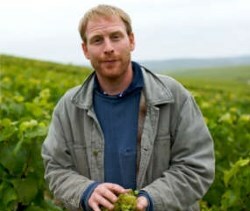 The vineyard sites that Patrick Piuze identified, whether Village, Premier Cru or Grand Cru Chablis are all planted with old Chardonnay vine-stock which results in smaller yields of fruit with greater concentration of flavours and minerals, the latter being part of the essential character of good quality Chablis. This is largely derived from the chalky soils of Kimmeridgean clays which were formed over millions of years from compressed shellfish and crustaceans in the Jurassic period. The area originally designated for Petit Chablis has Portlandian clay soil which was always considered less preferable. The cool climate of this vineyard area dictates that slopes with a more favourable southerly aspect will produce bigger, more concentrated wines. As part of his vineyard management philosophy the viticulture is sustainably managed with minimal spraying and all harvesting is carried out manually which is very much the exception nowadays in all but some of the steepest vineyard slopes in the premier and grand crus. Patrick's insistence on producing terroir focused wines has led him to make five separate village cuvées, unlike many other producers who blend theirs into one, because he says that they are all capable of expressing their own distinct characteristics from the different sites on either side of the valley of the River Serein which divides the area. 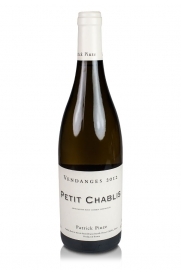 The vinification of Patrick Piuze's Chablis wines follows the same natural, minimal interventionist, principles that he adopts in the vineyards. 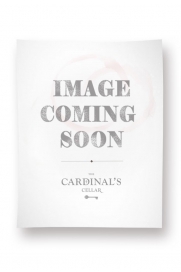 He has his own wine-making facility and to date carries out all of the vinification himself although he will be the first to tell you that nature makes the wines not him! Fermentation is done by natural, indigenous yeasts after a short maceration and takes place in temperature-controlled stainless steel tanks for the lesser wines or in used oak for the grand crus. For the élevage or maturation of the wine he only employs used oak barrels as he considers that new oak suppresses the full expression of the natural minerality of each terroir. He has an almost obsessional desire to let the terroir do the talking to the extent that special parcels of vines within a vineyard will be vinified and bottled separately such as his 0.12 hectare parcel of Grand Cru Bougros named “Cote de Bouqueyreaux” and similarly for the 0.29 hectares of premier cru Vaillons “les Minots”. After spending ten or eleven months in barrel Patrick bottles his wines with no filtering, the wines merely being racked once. Patrick makes dry white wines at all four levels of the AOC classification and his range includes seven grand cru bottlings, nine premier crus and the five separate village vinifications. 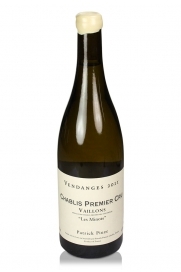 His Chablis wines make ideal accompaniments to a range of seafood, soft cheeses as well as roast pork and ham. The weightier wines are more suitable with richer sauces and the grand cru wines make a fabulous match with sashimi but - a word of caution is in order - forget the wasabi and go easy on the pickled ginger as the former will obliterate and too much of the second detract from the experience of the wine! 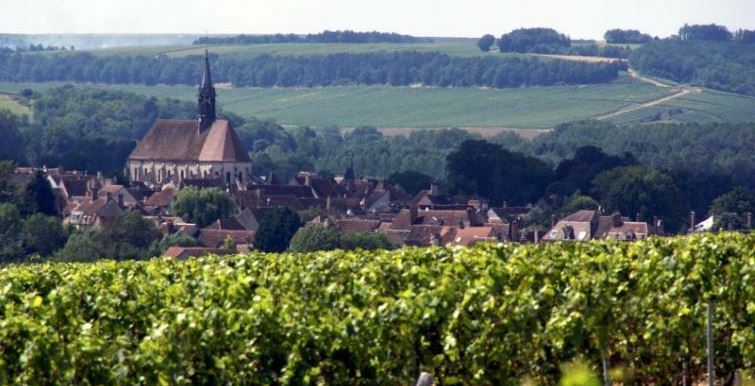 The biggest Chablis wines from the big, south-west facing hill to the north of, and overlooking, the town of Chablis. Pneumatic press used. Fermented and matured in used oak barrels. Chablis Grand Cru AOC Bougros "Cote de Bouqueyraux" - from a 0.12 hectare parcel on bedrock at a 45 degree angle. Chablis Grand Cru AOC les Clos - usually the biggest of the grand cru wines in Chablis. The better vineyards share the same prized exposure as the grand cru hill. These include Fourchaume and Montée de Tonnerre. AOC Chablis 1er Cru Butteaux, a sub-climate within the Montmains 1er cru vineyard. 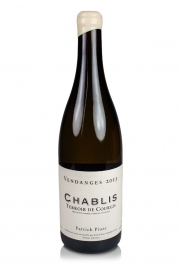 AOC Chablis 1er Cru Forêts - From a single parcel of 70 year old vines. 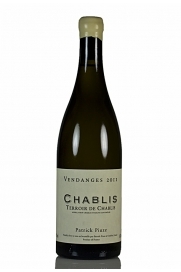 AOC Chablis 1er Cru Montée de Tonnerre - From another parcel of 70 year old vines adjacent to the grand cru hill. AOC Chablis 1er Cru Vaillon "Les Minots"
AOC Chablis 1er Cru Vaulorent - This vineyard is a sub-climat of the Premier Cru Fourchaume. It is situated on the grand cru hill but being outside the commune of Chablis it can not be classified as a grand cru itself. 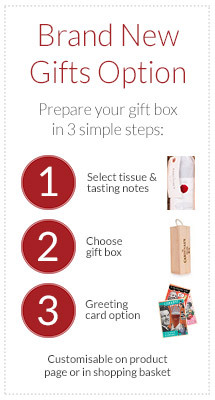 These four village wines are vinified, bottled and labelled separately. They see no oak at all to fully allow the expression of each terroir. AOC Chablis "Terroir de Chablis"
AOC Chablis "Terroir de Courgis"
AOC Chablis "Terroir de Decouvertes"
AOC Chablis "Terroir de Fleys"
AOC Chablis "Terroir de Fye"
Patrick Piuze also produces a non-vintage sparkling Crémant de Bourgogne as well as a Petit Chablis that is regarded as one of the better and weightier examples of what is usually a simple, crisp and straight-forward wine.